I recently discovered a new podcast, (link below) it’s called “Things Above.” James Bryant Smith shares thoughts based around Colossians 3:2 to ”set our minds on things above.” I hope you will give it a listen. Each episode is short (10-12 min) but incredibly powerful. Why don't you read out loud the phrase above? Perhaps a few times. When you look into the face of delight, what do you see? Up to this point what have been your thoughts on how God sees you? Does God just put up with you? Perhaps indifference? As a father I can’t help but be reminded what that delight looks like. I truly delight in my children; their vitality, fun, warmth, boundless energy, I just lap it up. I think I have struggled over the years to allow myself the thought that God delights in me. I’ve probably flitted from thinking He was either mildly disappointed in me or completely indifferent. I have come to realize this is more to do with my up bringing and the narratives and stories I’ve told myself about how love is and should be given. Much of the time when I was young, love was used as a weapon, something to be withdrawn when things got tough or when faced with failure. But friends, God’s love is not that way. His love isn’t conditional, it is not performance based, it can’t be earned, unlike so much of the worldly love we see, God’s love is freely given without strings. Wow! So as we begin to “set our minds on things above”, we begin to reshape the bad and misplaced narratives of the past and instead allow the truth of God’s delight in us to be our new story. Click the graphic to the left to listen to the podcast where these thoughts were originally heard. 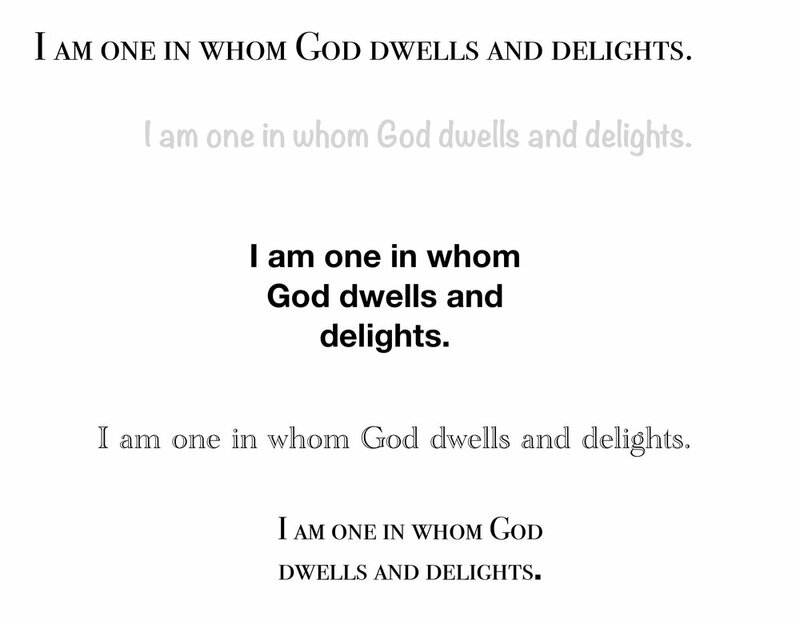 I have printed the phrase “I am one in whom God dwells and delights” on small cards and placed them about my life to remind me where my heart truly resides. Give it a try and I would love to hear your thoughts on this or other posts.